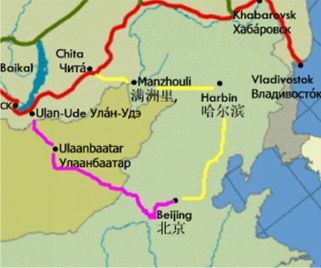 This line connects Chita to Beijing via the border town of Manzhouli and Harbin . From Tarskaya the Trans-Manchurian heads southeast, via Harbin and Mudanjiang in China's Northeastern Provinces (from where a connection to Beijing is used by one of Moscow - Beijing trains), joining with the main route in Ussuriysk just north of Vladivostok. 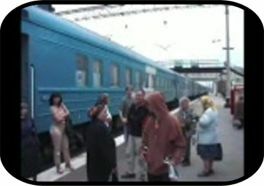 This is the shortest and the oldest rail route to Vladivostok. Some trains split at Shenyang, China, with a portion of the service continuing to Pyongyang, North Korea. This line was built in the early 1900s by Imperial Russia . Chita City is the Administrative Center of Zabaykalsky Krai. It was once called the " City of Exiles " as many of the the intellectuals and members of the middle class were exiled in the region during the late 18th and 19th Century. It is a Commercial hub for Trade in Siberia and was once home to the one of the biggest Jewish Population in Siberia. Chita is only one of the Region in Eastern Siberia with a Significant Muslim Population. Viaje en el Transiberiano en Mayo-Junio de 2007.